Fishing charters offer families and those on limited budgets a chance for some good, guided fishing. Most take sizable boats so they can carry a lot of anglers to keep costs down, use simple angling tactics and target species that are fun on the line and delicious on the table. Probably 99-percent of America’s charters are on a coast or the Great Lakes. Thankfully Kansas has Rader Lodge Catfish Charters, based out of Rader Lodge, near Glen Elder (a.k.a. Waconda) Reservoir. 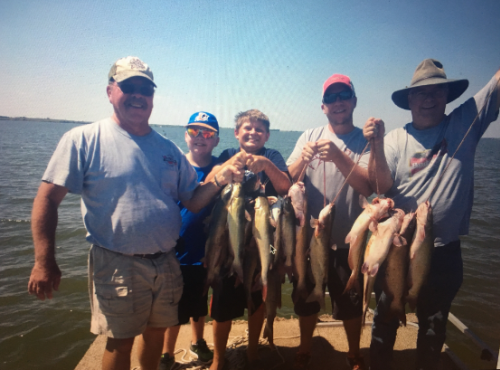 For about the past 20 summers lodge guides have helped hundreds of anglers catch many thousands of channel catfish. Seriously, some days they’ve caught more than 100 catfish per boat! The charter season begins around July 1, after the spawn and when catfish are hungry. Charters usually run at least through the end of August. The cost is $100 for adults. Kids 12 and under are $50. That includes a half-day of fishing and a night’s stay at the lodge. To help insure success, guides regularly dump large drums of fermented (rotten) soybeans at favored fishing spots. With excellent senses of smell, channel cats from all over the lake come a swimming for dinner. Most days see baited lines in the water by sunrise. Prepared “stink bait,” is aptly named and furnished on the trips. Anglers attach hooks covered in porous plastic that’s poked in buckets of the smelly goo with a long stick. Trust me, you don’t want that stuff on you! About any kind of rod and reel will work. The lodge has loaner outfits. Hooks and other needed gear can be purchased at a nearby bait shop. Guides are quick to work with beginners. That includes netting and unhooking catfish. Somedays the catfish are really biting. Somedays, almost not at all. Boats stay out all morning, though, because a slow bite can turn into piscine pandemonium at any minute. several charters and seen the extremes. The first time we had 110 for 11 anglers by 11 a.m., and they were still biting! Last time we only averaged about two fish per person. Still, it was enjoyable. To accommodate a number of people comfortably, Rader Lodge uses 28-foot pontoon boats. As well as elbow room, it gives people, especially kids, a chance to safely walk around a bit. Fish are cleaned at the lodge with the staff’s assistance. Rader often throws a small mountain of fillets into a fryer for a bonus lunch before guests head home. While you’re at Rader Lodge, drive two minutes south and check out Glen Elder State Park and the surrounding area.